We’d also love to take a moment and thank all of our clients that we have had to joy to work with this year. It’s always a little sad when the weddings are over and we don’t have an excuse to see you anymore - please keep in touch! In addition, thank you to all of the amazing vendors we have worked with, especially the photographers for providing us with these beautiful images. were married on January 12th at Old St. Mary Parish and held their reception at Hot Water Wherehouse in Milwaukee. They added wintery touches to their reception with a blue and white color scheme, glittery snow sprinkled across the tables, and a hot chocolate bar. As guests entered the venue, they enjoyed a polaroid station where they could take selfies and add them to the guest book with stickers. were married on St. Patrick’s Day at Schlitz Audubon Nature Center in Bayside. In fitting with the theme of the holiday, they chose green and gold as accent colors for their decor. While out taking photos with the bridal party, the group decided to stop at McDonald’s for Shamrock shakes! The reception was tons of fun with four different food stations for dinner and dueling pianos for entertainment. had two weddings! The first was in April in Japan with Minami’s family and the second was on May 5th at the Best Place at Pabst Brewery in Milwaukee. Being that they were planning two weddings at once and were planning this wedding from overseas, they kept it fairly simple and relaxed. Since most of the guests were not able to attend the wedding in Japan, they shared a slideshow of pictures during the reception. were married on May 19th at Surg on the Water in Milwaukee. Their dogs, Chloe and Leia, were able to be a part of their wedding day, which was so much fun! The pups were at the Iron Horse Hotel with all of the ladies as they were getting ready and Deanna and Trevor made sure to stop back in after their first look to get photos with their fur babies. The ceremony was on the patio overlooking the river and the sun came out just in time. Guests had so much fun on the dance floor all night, as well as playing some board games that the bride and groom provided. were married at The Landing 1841 in Burlington on May 26th. 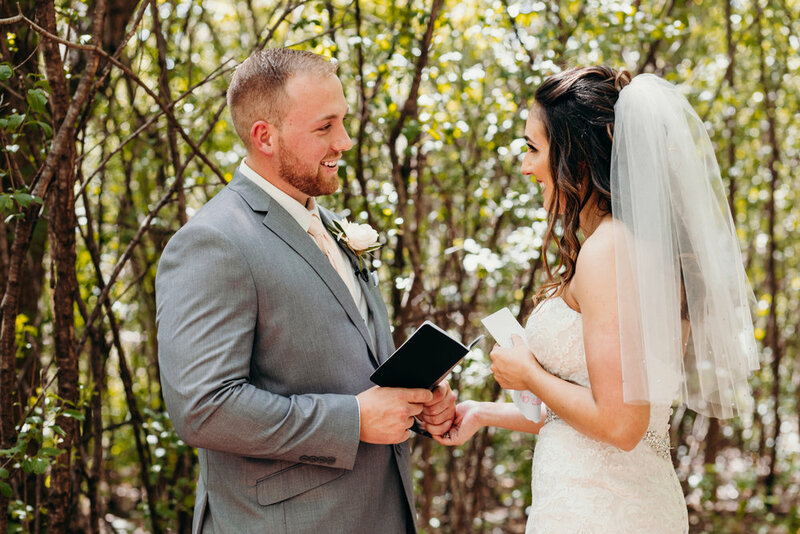 During their first look, they read their vows to one another privately before their ceremony. They opted for a less traditional reception with heavy passed appetizers instead of a formal sit down dinner. This allowed guests to mingle and dance all night and eat at their leisure. There was definitely no shortage of food - they also had a mac and cheese station and a dessert bar with many delicious options. The mother of the bride surprised everyone by hiring Bolivian dancers to perform a few dances during the reception. were married at the Chinese Christian Church of Milwaukee and had their reception at the Milwaukee Art Museum on June 2nd. It was a fairly traditional wedding with a string trio performing at the ceremony and a receiving line as guests entered the reception. The bride and groom surprised their guests with frozen custard from Culver’s, which I imagine was a welcome break between dances! were married on June 9th at First United Methodist Church and held their reception at Bacchus in Milwaukee. This was a fairly intimate affair with about 50 guests, which allowed them to be able to visit with everyone throughout the day. Some of Baraa’s family flew in from Iraq, so the DJ intermixed music from both of their cultures, which kept the guests on the dance floor all night. were married at the North Point Lighthouse and had their reception at South Second in Milwaukee on June 23rd. They chose a travel theme and each table was named after a city they had traveled to and they hand-wrote the importance of each destination on the back. Instead of the traditional place card, they wrote each guests’ name on a mini paper airplane, which they hung on twine. They ended the night with something we had never seen at a wedding before - a pinata! were married in Estes Park, Colorado on July 6th. In their debate between eloping and having a regular wedding, they decided on a destination wedding in their home away from home, Colorado. They woke up at 3am on their wedding day to get ready and head up to the mountaintop for their first look and to exchange vows during sunrise. Later in the day, they held a ceremony and reception for their guests. Dinner was served via a food truck and the desserts looked too pretty to eat! were married at Rustic Manor 1848 in Hartland on July 13th. Their wedding was fairly laid back with an outdoor ceremony in a rustic barn setting. Guests found their seats for the Mexican dinner with handcrafted cork keychains. Before dinner was served, the bride and groom performed a photo blitz where they went around to each able for a group picture and it had to be completed within the time it took the DJ to play one song. This was a bit of a challenge since some of the guests were sitting upstairs in the loft, but they finished it just in time! were married at the Oconomowoc Community Center on July 14th. They started their celebration with an outdoor ceremony overlooking the lake. Amie chose a red beaded gown with matching red shoes, which was also the accent color for their decor. Chris’ mom is a baker and there was no shortage of sweets! She baked two different flavors of cookies, the groom’s favorite chocolate eclair cake, and each table was adorned with a cupcake tree. were married on July 21st at Old St. Mary Parish and held their reception at the Harley Davidson Museum in Milwaukee. In between the ceremony and reception the bridal party went on a pub crawl at Pabst Brewery and City Lights Brewing Co. They wanted an indoor/outdoor feel at their reception which they achieved by opening the large garage door and creating a fun atmosphere with string lights and many games for their guests to enjoy. After dinner, their guests were treated to a huge dessert table, featuring many different flavors of donuts from Cranky A'l’s. were married at Andrew’s family property in Lake Geneva on July 28th. They planned an intimate affair with about 15 guests. Guests gathered in a circle for their ceremony on the front lawn. Cocktail hour took place on the patio and their specialty cocktail was an aperol spritz. They hired a personal chef to prepare dinner, which they served in the sunroom. It was so nice that everyone was able to sit together at one table. held their ceremony in Kelsey’s parent’s backyard on August 11th. Their wedding was very colorful from the flowers they chose to the ribbon backdrop they made. They even had custom flags made with their names and date, which they strung up outside and sent home with their guests as favors. Following the ceremony, a marching band led all of the guests in a parade to Pizza Man for the reception. were married at The Abbey Resort in Lake Geneva on August 18th. They incorporated their love of Disney throughout the entire day - a hidden Mickey scavenger hunt, homemade Tangled lanterns hanging from the ceiling, and Disney loves quotes down the ceremony aisle. Centered on each dining table was a lantern handmade by the mother of the bride, each one featuring a different Disney movie. After dinner, tables competed against one another by singing Disney songs from their table’s movie. The bride and groom also created a custom Disney slideshow, which was projected onto their wedding cake before they cut it. were married at Virmond Park in Mequon on August 18th. Their Jewish ceremony took place on a bluff overlooking Lake Michigan and they stood underneath a chuppah built by one of their good friends. The reception took place inside a beautifully styled tent. After dinner and cake, they served Kopp’s custard, Oakland Gyros, and Ian’s pizza for late night snacks, so I don’t think any of their guests went hungry! were married at the Edgewater Hotel in Madison on August 18th. Their ceremony took place on the Grand Plaza, which overlooks the lake, and their reception took place inside the Mendota Ballroom. They opted for a neutral and classic color palette of white and blush accented with greenery and gold. Their late night snack was cheese curds, which I’m sure all of the Wisconsinites appreciated! were married on August 24th at Terrace 167 in Richfield. They chose a rustic theme, which complimented the bride’s love of horseback riding. The ceremony took place outside underneath string lights, surrounded by trees. The theme carried throughout the reception venue, which had wooden tables with greenery down the center. The bride wore an open-backed dress, which perfectly showcased her horse tattoo. were married on August 25th in Evanston, Illinois. They had a lovely outdoor ceremony in a park, followed by cocktail hour in a garden setting. When guests arrived at the reception at the Levy Center, they signed matching jerseys in place of a guest book. The bride and groom’s love of Harry Potter was showcased with a homemade Sorting Hat on display, which “sorted” guests to their perspective tables. were married at St. Anthony’s Church and held their reception at the Intercontinental Hotel in Milwaukee on September 8th. It was so special to see how involved Jamie’s dad was in the planning of their wedding and how much he enjoyed it! Jamie and Connor performed one of the best grand march entrances we have ever seen and it was so much fun to watch. After dinner, we witnessed a really special tear-jerking moment where Jamie’s dad presented her with a letter from her recently deceased grandma. were married at on September 22nd at St. Joan of Arc Church followed by their reception at The Cupola Barn in Oconomowoc. They had an elegant fall barn wedding with a caramel apple at each place setting as favors. After dinner, a belgium waffle food truck arrived and guests could order their waffles with custom toppings for dessert. To take a break from dancing, people could sit around the firepit with blankets provided by the bride and groom to keep cozy. were married on September 29th at Cathedral of St. John the Evangelist and held their reception at Pritzlaff in Milwaukee. They chose a Great Gatsby theme and the entire place was decked out in black and gold with very unique centerpieces. They had so many special touches including a champagne bar upon guest arrival, cake, cupcakes AND ice cream for dessert, an empanada truck for late night food, and a bourbon bar in the vault. They even projected the Milwaukee skyline behind their head table, which created an amazing backdrop for photos. were married on September 29th at North Shore Presbyterian Church and held their reception at Lake Park Bistro in Milwaukee. They had a morning ceremony follow by a brunch reception on the lake and an evening after party on a rooftop overlooking the city. A string quartet played during brunch and one of the musicians played a violin that was handmade by the groom. The bride looked stunning in her beaded long sleeve dress, which was perfect for a fall wedding. were married at the DeKoven Center in Racine on October 5th. They incorporated fall colors into their October wedding and DIYed some of their decor, including the ceremony arch. The best man assisted in a ‘first look fake-out’ where he dressed up in a dinosaur costume to surprise the groom. Both the bride a groom wore special bridal themed aprons during dinner to keep from spilling on themselves, which is something we had never seen before. were married at Pritzlaff in Milwaukee on October 5th. They incorporated a garden theme, naming each table after a different herb and using a flower box to display the place cards. The bride wore a simple gown with an open back and a flower crown in her hair. For dinner, guests could enjoy various food stations - create your own mac and cheese, Indian selections, and a taco bar. After dinner, warm shots of liqueur were passed around while guests enjoyed their cake. were married at Seven Seas in Hartland on October 6th. The ceremony and cocktail hour were held outside on Lake Nagawicka. The bride and groom stood in front of a beautiful vine lattice backdrop designed by Jane Kelly Floral. The had a dessert bar with assorted candy and mini cupcakes and the hit of the night was the cheesecake. Throughout the reception, guests enjoyed the live band and photo booth. 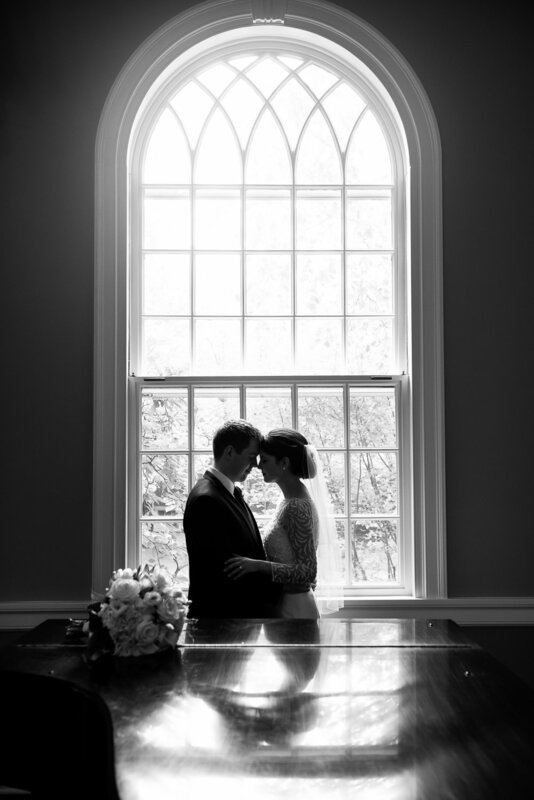 were married on October 12th at Old St. Mary Parish and The View at Trio in Milwaukee. It was a brisk fall evening, but they kept guests warm by serving hot chocolate (with Baileys if desired) in custom camp-style mugs. The reception was decorated with lots of greenery and rose gold accents. Marquee letters lit up the bar top and spelled out their hashtag ‘BILLIAN’ (Billy + Jillian). were married on November 3rd at South Second in Milwaukee. The reception was decorated with greenery, lots of candles, and marquee lights. Clare painted the place cards and table numbers with water colors in different shades. After dinner, guests enjoyed an assortment of donuts while they danced the night away. were married on November 10th at Old St. Mary Parish and held their reception at Discovery World in Milwaukee. It was a cold day with fresh snowfall and they managed to get some epic outdoor photos. As guests entered for dinner, The Pilot House sparkled with candles on every table and string lights over the dance floor. It was a simply stunning view, both inside and out. If you are looking for a wedding planner for your upcoming wedding, you can learn about the services we offer here. We are still waiting on photos from a few of our weddings, so if you are one of our couples and noticed you were not featured, please contact us.